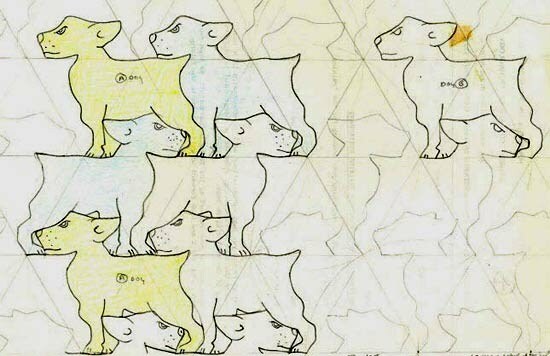 Dogs are a motif that for tessellation purposes are most difficult to accomplish, at least to an acceptable degree, as their outline is so specific (as discussed in Essay 14 Ambiguity of Outline), albeit with different breeds there is indeed variation of outline, and so consequently there is little scope for any variation of note. (The examples below are all of a muchness.) The reasons that underlie this are discussed in greater detail with Essay 3, Motif Choice. As such, the examples below, despite being of an broadly acceptable quality, display shortcomings in terms of their inherent quality to lesser or greater degrees. Perhaps an indication of how difficult this particular motif is to compose was shown by Escher, who only did two such examples (Nos.16 and 97). Consequently, as this particular motif is relatively difficult to achieve, resulting in fewer numbers than with the ubiquitous birds and fishes, this is thus of more interest per se. This example shows two distinct, albeit similar types of dogs, with the lower diagram having been derived from the upper, as an 'improvement', most noticeably with the dogs' mouth, which is now closed. As such, although the difference is slight, the improvement should still be discernable, as with the mouth being open, such a dog is not anatomically correct, the lower jaw being undershot, resulting in an inferior example in these matters. Although indeed such an ‘open mouth' idea does possess advantages (as it can define the dogs paw, as exemplified in Escher's Bulldogs), in this particular instance I favour the latter. No matter, both of these are of a relatively high quality, with the head and body being in admirable proportion, albeit even so I am still not entirely happy with the legs, which are somewhat contrived. However, as dogs remain a most trying motif, such inexactitudes on occasions do have to be accepted with equanimity, as here. 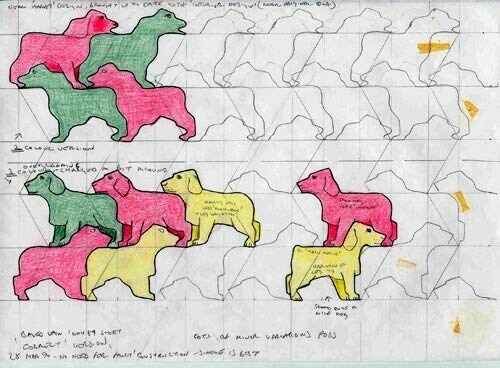 Of note here is the attempt to compose a specific breed of dog (a St Bernard), this being an additional degree of difficulty in composing dog-like motifs, as the resemblance to breeds has less variety of line possible than with a generic dog. Consequently, such examples are thus more praiseworthy.